Arabic papyrologist Naïm Vanthieghem has added a paper to Academia.edu, publishing an Arabic paper fragment held in the Rare Books Department’s Arabic Papyrus, Parchment and Paper Collection. The paper is titled “Une contribution pour la table d’un prince ikhchidide. Édition de P. Utah Inv. 1383” and may be downloaded here. Naïm Vanthieghem has identified this piece as being written in Cairo about 954. 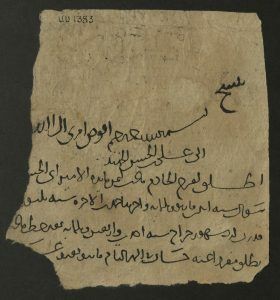 The fragment concerns business with Abū al-Ḥasan Alī b. Muḥammad al-Iḫšīd, “the third and last sovereign Ikhchidid,” about whom little is known. In the past, Naïm Vanthieghem has contributed descriptive terms to many pieces from the Utah Arabic Papyrus, Parchment and Paper Collection and published several pieces in international academic journals. Read about some of his other articles here. Thank you, Naïm! We look forward to seeing more of your work with our collection.